I didn’t really make myself much of a summer wardrobe this year, but I’ve made up for it by making a few shirts to wear this fall! I have wanted the Wiksten Tova shirt patternÂ for a long time now. Periodically I read a post about it, or I see one on Flickr, and it rekindles my lust for the pattern. I hadn’t bought it thus far, mainly because I wouldn’t typically spend this much money for a pattern (oh, and the fact that it’s often all sold out doesn’t help either!). After a couple years of this, I decided to bite the bullet and buy one after Jenny added some to her shop. And I’m quite glad I did, since it’s a wonderful pattern!Â I’m so pleased with patterns that are well written and which turn out as pictured, and I really love it when they fit, without having to make any adjustments. This is one of those patterns. I made my first out of one of Jay McCarroll Habitat prints, then made a second out of this lovely Nani Iro fabric. I extended the length of the sleeves on this one, so it’d be a bit better for winter. And then I made a third out of this great Liberty fabric. I told you about Isabel, right? She’s an extremely generous blog reader who sent me some Liberty fabrics. Several pieces were quite large, so I took the opportunity to use one for this shirt. I love the paisley print – the color is great for fall, don’t you think? Again, thanks so much Isabel!! And here’s one more shirt – though I didn’t have to make this one! 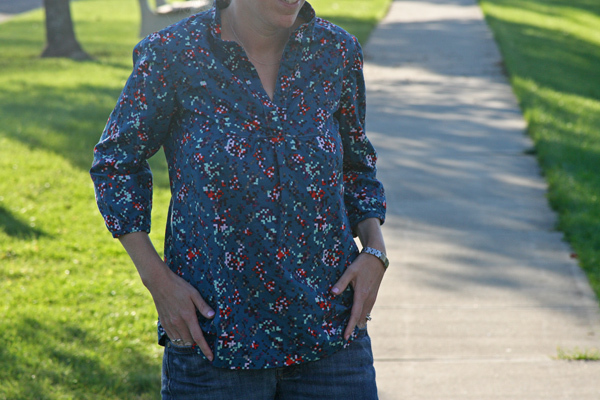 My wonderfully sweet friend Phiona made up this lovely Schoolhouse Tunic out of one of my favorite AMH Loulouthi prints. I love the look of this one, and I totally love that it was made for me – thanks Phiona! This entry was posted in Clothing and tagged Clothing, habitat, handmade, nani iro, schoolhouse tunic. 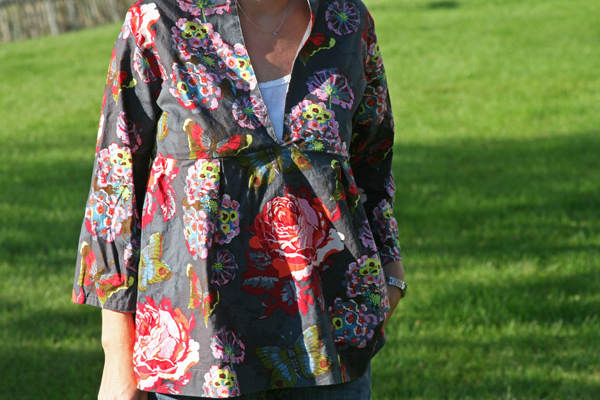 lberty, sew liberated, shirt, tova top, wiksten. Bookmark the permalink. 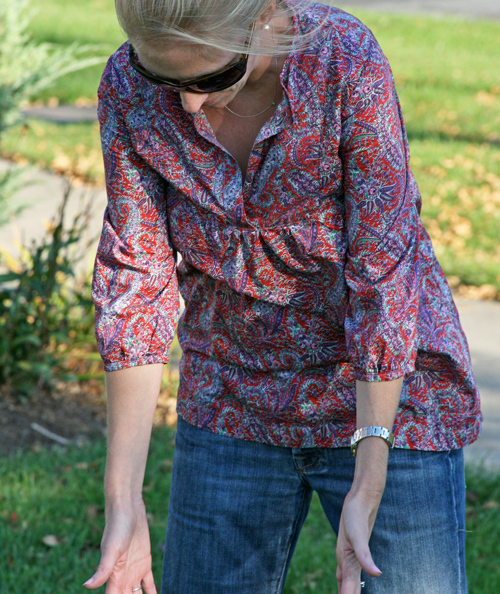 32 Responses to fall shirts… for me! that’s so funny – i, too, have been lusting after tova for years, and just bought it in the last round. i haven’t jumped in yet, but i’m excited to! Cute! I have never seen this pattern before, but I really like it. 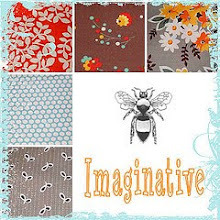 I love the habitat fabric you used too! Those are beautiful – great pattern! I don’t know where or how you find the time to do so much sewing with a baby though, wow. Those shirts are just perfect! I’d love a whole wardrobe full! So glad you were able to get the pattern! Isn’t it great? 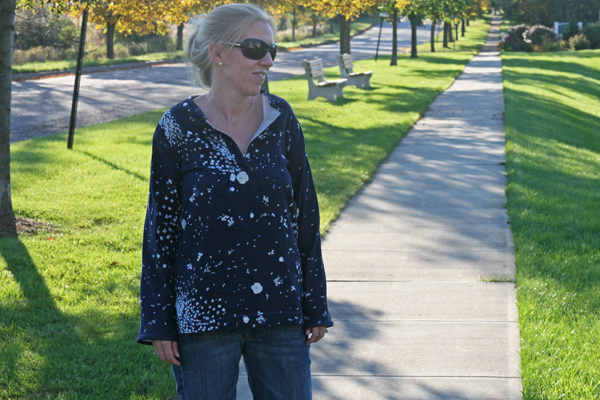 Funny, I opened your blog this morning while wearing my Tova top sewn up in one of AMH’s voiles. Great minds… 🙂 I have another in a fine corduroy that I love for winter. Can’t wait to see your dresses in wool. I need to get myself over to Pendleton and get some wooly goods myself and get a Tova dress sewn up too! Ashley- I love them. Been thinking about making a shirt- taking the plunge into clothing- these totally inspire me! They are all great! I especially love the Habitat one. love these…i should really make clothes for myself. you’re pretty inspiring, my friend! My Tova pattern arrived on my doorstop yesterday afternoon and I’ve been deciding on fabrics… perfect timing for your post! I do love that Liberty version. love the Tova! I’ve been coveting it too. this Nova really needs a Tova 😉 ! seriously, you just whip out 3 shirts like it’s no big deal. You’re amazing!!!! Love the Tova, I’ve got pattern envy going on! I’m really impressed with all those tops – they look great! I just made a little dress for a friend’s little girl using that same habitat fabric – it looks great as clothing! Delighted that you were able to use the fabric for something personal, Ashley. Love the pattern too. Thank you so much Isabel! I will think of you each time I wear this lovely top! I love the blue colour shirt. It is the type I would definitely wear to a casual going out. The other ones are also very lovely. I just LOVE that Habitat print. Can’t get enough. Great top. I bet you could make it in voile for a dressier work top too. they are gorgeous shirts, you have inspired me. 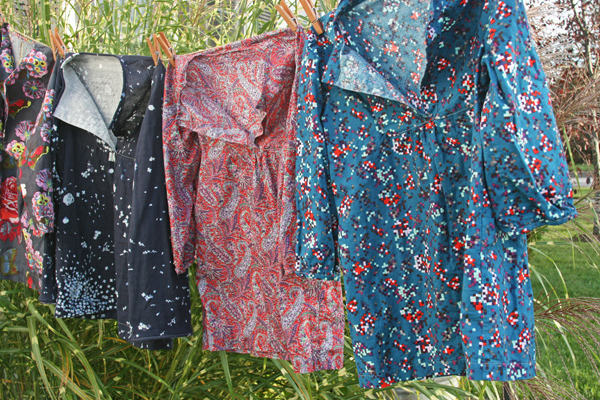 Love the shirts–and the Liberty fabrics were perfect! What a cute pattern. I love your fabric choices too. What size did you make? I made a small in the Tova shirt. I’m not sure what size the Schoolhouse Tunic is, since I didn’t make that one! I really love all your shirts! 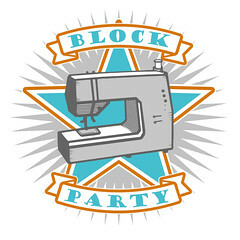 I haven’t sewn clothes before but you’re really inspiring me to make myself a whole slew of shirts. I definitely have the same style that you do and love the idea of being able to pick out the exact print I want. Besides the 2 patterns you have here, do you have any other suggestions for a beginner? Do you think I’d be able to make these 2 that you have? Thanks!! Thank you Ruth! Sewing something that you can actually wear is fun! I really like both of these patterns, as well as the Make It Perfect Shearwater Kaftan (I’ve posted about these several times – you can search my blog for those posts). I’m also about to try the newest pattern from Make It Perfect, the Honey Blouse, so I’ll be sure to post about that once I’m done. The Tova and Schoolhouse look very similar. Do they fit similarly? I have never sewn any clothing for myself and was planning to try a top. I’d been tossing up the Tova, Honey blouse and Shearwater kaftans when I came across this post. Did you end up trying the Honey blouse? Your Tova shirts all look great but I especially like the liberty version.